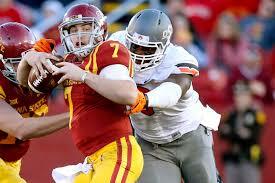 DE/OLB- Emmanuel Ogbah, Oklahoma State 6′ 4″ 273 lbs. Cons: The junior is a raw player who doesn’t use a variety or perfect any true pass rushing moves to set up the blockers lined across from him. He tends to let the offensive lineman guide him to the outside, when it might be quicker just to go right through him. Ogbah has a bad habit of standing up to quickly, lacking explosive hips, and lets blockers into his body. The former Cowboy needs to work on anchoring a spot, and become more flexible to move around the line of scrimmage. His motor leaves a little to be desired as he can drift when the play isn’t coming his way. Pros: Ogbah’s biggest asset is his ability to play up and down the line on either the left or right at defensive tackle, defensive end, or as an outside backer in a 3-4. He is comfortable lining up in a four, three, or two point stance using an equal blend of power, speed, and leverage. The former Cowboy has a powerful, physical style that bullies offensive linemen with his big, meaty paws. or just knocks down passes (had four passes deflected in 2015). The defender is a better pass rusher than a run stopper and does a great job kicking inside to get to the quarterback on passing downs. When asked, Ogbah drops back into coverage quickly and even lined up defending the slot receiver on occasion. His athleticism was on display at the Combine when he ran a 4.63 40-yard dash, jumped 35.5″ in the vertical and 121″ in the broad. This also shows up when he spins away from blockers while moving up and down the line of scrimmage using amazing balance. Overall impressions: The former Cowboy might be one of his classes best pass rushers, but will need to become more effective against the run. His value in fantasy football will be greatly tied to the defensive scheme he gets drafted into. I like him better as a defensive lineman than as an outside linebacker, but he could excel in either role. Don’t look to draft him before the second to last round in your rookie draft. « Austin Hooper: Continuing the Stanford Tradition?